The life of the Revered C.T. Vivian is practically the story of the modern black freedom struggle. Vivian actively participated in the Nashville desegregation movement, Freedom Rides, Birmingham, Selma, Chicago, and other chapters of the fight for equal rights. Born Boonville, Missouri on July 28, 1924, Vivian moved with his mother to Macomb in rural west-central Illinois a few years later. Vivian spent his formative years there, in a tiny black community, graduating from high school in 1942. He soon enrolled at Western Illinois University, also in Macomb, though he moved to Peoria before finishing his degree. In 1947 Vivian participated in his first civil rights protest, successfully desegregating Peoria’s lunch counters. Also while in Peoria, Vivian met and married Octavia Geans of Pontiac, Michigan. They are still married and had six children together; Vivian also has a child from an earlier relationship. C.T. Vivian began preaching in Peoria but, in 1954, moved to Nashville to study at American Baptist Theological Seminary (now College). There he worked with many of the leaders of the civil rights movement, including Diane Nash and John Lewis. Lewis, Nash, Vivian, and others were trained by the Reverend James Lawson in Gandhi’s philosophy of nonviolent direct action, as both a tactic and ideology. They founded the Nashville Christian Leadership Conference which organized the first sit-ins in the city. On April 19, 1960 Lewis, Nash, and Vivian led 4,000 demonstrators in a march on Nashville’s City Hall where they won concessions from Mayor Ben West who publicly agreed that racial discrimination was morally wrong. Later in 1960 Vivian joined the Student Non-Violent Coordinating Committee (SNCC) and emerged as one of the leaders of the Nashville sit-ins. The following year, when the original Freedom Riders of the Congress of Racial Equality (CORE) were forced to stop, due to the violence directed against them, Vivian and other SNCC members traveled to Mississippi to continue the protest ride. He and other SNCC protesters were arrested in Jackson, Mississippi and transferred to Parchman Prison Farm where they were beaten and tortured. Later in 1961 Martin Luther King, Jr. appointed Vivian as Director of Affiliates for the Southern Christian Leadership Council (SCLC). Vivian was responsible for coordinating the activities of branches nationwide. In 1963 he helped lead the fight to desegregate Birmingham and in 1965 he was an organizer of the voter registration drive in Selma that became the catalyst for the 1965 Voting Rights Act. While in a Selma jail Vivian was beaten by Dallas County Sheriff Jim Clark. By 1966, Vivian had returned to Illinois where in Chicago, and elsewhere, Vivian established organizations to assist black children in their efforts to stay in school and go to college. 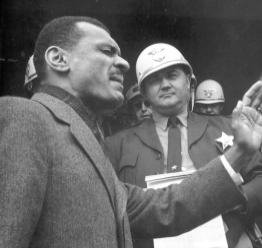 He also worked with Jesse Jackson’s Operation Breadbasket to push the city and labor unions to promote affirmative action in the building trades, a key issue in the late 1960s and early 1970s. Cordley Tindell Vivian has resided in Atlanta, Georgia for more than three decades. Though ostensibly retired, he continues to work on behalf of the needy, most recently with victims of Hurricane Katrina. C.T. Vivian, Black Power and the American Myth (Philadelphia: Fortress Press, 1970); Lydia Walker, Challenge and Change: The Story of Civil Rights Activist C.T. Vivian (Alpharetta, Georgia: Dreamkeeper Press, 1993); http://www.stanford.edu/group/King/about_king/encyclopedia/vivian_ct.htm.